Another Olsen Kid — Who Knew? I hereby vow **holds hand up** that I will blog at least once a week, more often if I can, until I’ve covered more of my TIFF films. This is not an “easy” film but I was completely enthralled and mostly because of the performance by its lead, Elizabeth Olsen, pictured here with Sarah Paulson who’s always interesting to watch. I didn’t know until after seeing the film that the actress was the younger sister of the Olsen twins and I’m glad I didn’t know, because I might have been distracted thinking about it. But maybe not. She was pretty remarkable in a not very easy part. Time will tell whether or not her performance in her debut movie was fluke but I’m guessing not. The real challenge of this part is that she has to play this young woman in several different states of mind. One is a lost teen searching for approval and a place in the world. One is a happy, eager new member of a cult, thinking she’s finally found acceptance and love. One an obedient soldier in the cult, broken but steadfast. One a desperate escapee on the run. And finally a girl trying to adapt to the real world again and figuring out how to live with her sister and brother in law. The timelines interweave. If memory serves (this is the problem with blogging more than 2 months later) we first see the escapee version of her character, then the girl trying to cope, then we flash back to when she first met the cult members etc. The tension continues to build as we see more and more of what this girl went through and understand why she’s so messed up and acting in such a bizarre manner in the present. The cult leader is played by John Hawkes from Deadwood and Winter’s Bone. He was also fabulous in this. When I was a teen everyone was talking about cults… Maybe because the idealism in the 1970’s and the disillusionment with “society” (remember antidisestablishmentarianism?) led more young people toward cults… But this film reminded me why being brainwashed haunted my twelve year old nightmares. The ending of this movie will likely tick some viewers off. I saw it with a festival audience and even then a few people shouted at the screen at the very abrupt ending. But those people might not have been angry… more startled. That’s all I’m going to say, except that with hindsight it was the perfect ending. The only other way they could have gone would be to add a big third act climax with a Hollywood ending… (think the hilarious last act of Adaptation after Charlie Kaufman goes to Robert McKee’s Story seminar) but it’s just not that kind of film. And we’ve seen enough at that point to deduce what’s about to happen after the projector shuts off. If you have any tolerance for “art films” this is one you should see. I think Elizabeth Olsen might end up nominated for some awards and might just be a new rising star who will make people think of Kate and Ashley as Elizabeth Olsen’s older sisters rather than the other way around. Dang, I am a bad blogger. I promised I’d get around to talking about some of the other TIFF films I saw last weekend. My how time flies. While I haven’t found time to blog in the past 10 days, I did manage to see three movies 😉 . All films that were at TIFF, but I didn’t pick to see there (mostly because I knew they were coming out right after the festival.) I think all three of the fest movies I saw post-fest were great: Drive, 50/50 and Moneyball. If I had to pick a favorite, I’d have to go with 50/50, (because it’s the easiest to “like”), but if I had to pick the one I thought was “best” I’d go with Drive. But back to The Ides of March. 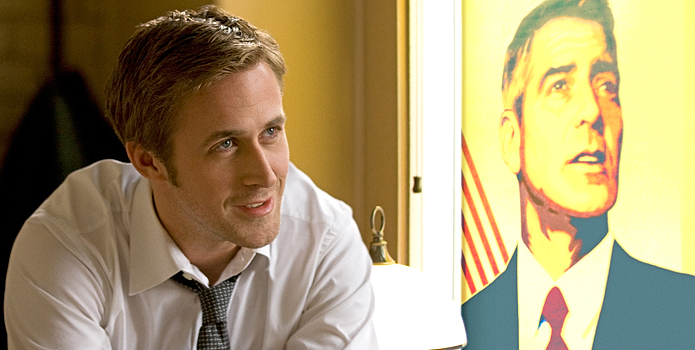 This is a political film starring George Clooney and Ryan Gosling (sounds great, right?) and co-starring Paul Giamatti and Phillip Seymour Hoffman and Marisa Tomei and Evan Rachel Wood (sounds even better, right?). I mean stellar cast, stellar performances, interesting topic… It should have been a home run (to use a metaphor more suited to Moneyball). But it wasn’t home run for me. Don’t get me wrong, it was very good. But I wanted to be blown away and I wasn’t. I keep trying to put my finger on why…. I think it’s because there’s really nothing new or groundbreaking about this story. Call me cynical but it’s not news to me that otherwise good people with strong values and ideals can do unethical and immoral things in pursuit of power. And in this case in order to get the democratic nomination for the US Presidency. I feel as if Primary Colors already covered that ground and while this movie is more serious and dare-I-say smarter than Primary Colors, I’m not sure it was as entertaining. I’m not saying don’t go see it — especially if you’re a fan of either Clooney or Gosling — but don’t get your hopes up as high as mine were, because super-high expectations are hard to live up to. Drive and 50/50, on the other hand, both lived up to my expectations. But I’ll talk about those soon. I promise this time. After promising to post some reviews, I guess I should follow through. I’ve hit that evil just past the middle place in my current WIP and I’ve been spending a lot of time banging my head against the keyboard and haven’t felt much like blogging. But here’s my take on a couple of films that are out or will be out soon. I actually already talked about this one here. According to imdb.com it was released in the US on September 16th. I don’t think it’s showing up here in Canada. I give this a “maybe worth a rental” rating. I love Mia Wasikowska–think she’s incredibly talented–but the screenplay didn’t live up to her performance for me. This was the one “second choice” I got this year. I’d chosen A Dangerous Method (which doesn’t open until December) but wasn’t that disappointed to get this screening instead. Both screenings were “day after the gala” showings so it’s not like there was any red carpet action going on anyway. This one releases Oct 28th, and if you haven’t already seen the trailer (they’ve been showing it for MONTHS already) it’s set in Elizabethan times (not QE2) and posits another theory for who actually wrote Shakespeare’s plays, plus some interesting theories about the rightful heir to Elizabeth’s throne. At least this theory was a new one to me, although I certainly don’t pretend to be all that informed about Shakespeare theories. I was definitely aware of the theories that Will could not have been the true author, since there’s no historical evidence he was educated, never mind being able to write. The Shakespeare character in this movie (a minor role) was very funny and I enjoyed him a lot. I also like the young Earl of Oxford, played by Jamie Campbell Bower, who plays Arthur in the TV series Camelot. 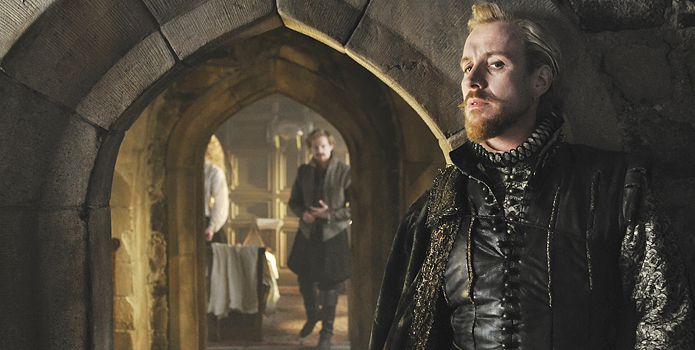 But I’m not certain I really bought Rhys Ifans (photo above) as his older self. I didn’t immeditately recognize Ifans, so I don’t think I was affected by other goofier parts he’s played, but I just didn’t buy him as a leading man. I honestly thought he was the villain in the first few scenes he was in and it took me a while to figure out who was who and what was going on. My overall reaction might have been different if I’d seen him differently from the start. (One reason to see again is to see if the screenwriter or actor or director missed an opportunity to make me like/identify with the protagonist…) I think the problem is that they make you think that Ben Jonson is the main character, but he’s really not…. Talking about Ifans not really working for me and my issues with identifying a main character probably leads me to my overall reaction to this movie which is: I’m not sure… I think I’m going to see it again when it comes out. My biggest problem had nothing to do with the movie (I don’t think) but to do with the couple who were sharing my row near the front right side of the Elgin and destroying my concentration. Both of them had their phones out through the movie, frequently flashing in my eyes, in spite of my telling them to shut up and turn off their phones a number of times. People have suggested I should have called an usher (or one of the big burly men with night vision glasses) but I figured that would just cause more disruption for other people, and I’m not sure if the the big burly men care about phones shining in people’s eyes as long as you’re not filming…. Generally festival goers are better behaved than this pair, but it was a weekend screening and I don’t think they were true “festival goers” if you know what I mean. Anyway, it was brilliant to cast mother/daughter acting team of Vanessa Redgrave and Joely Richardson as the younger and older versions of Queen Elizabeth I and the obvious age difference between Richardson and Bower (who plays the young version of Oxford) made one major plot twist even more deliciously creepy. I think this one is worth seeing on the big screen–it’s beautiful if nothing else. Full of interesting conspiracy theories about an fascinating historical time. And like I said, I plan to see it a second time. But it didn’t blow me away as much as I’d hoped. Will post my review of The Ides of March some time over the weekend. I am going to start posting reviews of all or most of the 32 films I saw… but for now, I thought I’d post an overall review of this year’s festival. I know. Exciting, right? This is more important than you might think. The weather wasn’t absolutely prefect, but while it was kind of hot and humid near the beginning (if you got stuck in a line in direct sunlight) and kind of nippy later in the week (waiting in a line at night), it didn’t rain! (more than sprinkles) and was overall neither too hot nor too cold. Yay. With all the waiting in lines involved in the festival, this is key. A few of the days were downright gorgeous early fall days. All of my trips down to the box office went smoothly — picking up book, dropping off picks, picking up tickets, buying a few single tickets, exchanging a ticket… That members and donors line is AWESOME. On the other hand, I was annoyed that there were even more premium screenings this year. It was hard to pick films to see in the evenings the first weekend because so many of them were off limits for picks with passes and coupons. I think the festival should add some kind of pass or coupon booklet where you can pre-select a certain number of premium films… I don’t like buying a Gala pass (hate seeing movies at Roy Thompson Hall) and found the Visa Screening Room disappointing, too, because you end up with no choice… But why not a 10 coupon book or 5 coupon book for premium screenings… In my perfect festival world, I’d have a 30 film pass where I could pick up to 5-10 premium screenings within my 30. Okay, this is a pretty personal one, but also important. Back when I used to buy a 50 Film pass, I got a cold every year. I haven’t become ill the last couple of years because a) I no longer try to go to 9:00 am screenings. That’s just crazy. And b) I make sure I eat better than I used to and drink lots of water. But this year I got a monster zit on my nose, the likes of which I’ve never seen before… So not an A worthy health year. I noticed that now that everyone has a blackberry or iphone in line, no one talks anymore. Nor are they as likely to chatter with seatmates once seated in the theatre. I miss that. Although I do admit to checking my e-mail and reading on my kindle in lines and in my seat while waiting for screenings, too. Next year I vow to talk to more people (assuming I go again). I’ve met so many cool people at TIFF over the years and missed that this year. It’s fun to hear what everyone else loved and compare notes on films you saw in common. Plus, I get kind of strange when I go 10 days without much human interaction. Scary really. And the big zit didn’t help. The festival just isn’t as exciting as it used to be. Maybe I’m getting jaded, but I think it has to do with the fact I couldn’t pick any of the premium screenings and most of the “red carpet” events were deemed premium. Also, I somehow picked quite a few films this year that didn’t have a Q&A, even though it was a first screening… and didn’t have any of those great surprises when the director or actors show up at a next day screening. I miss that. My day started with Rampart, starring Woody Harrelson. I will post more about this film… Overall: great performances, interesting, too long. At least that’s what I think was “wrong” with it for me. Then I went to a talk between Indian-born, Canadian filmmaker, Deepa Mehta and Salman Rushdie. She is currently making a movie of his book Midnight’s Children that will be out in October 2012. It was a pretty cool talk. I haven’t read the book, but the talk made me really want to see the movie and tackle the book, too. Sounds like my cup of tea… No pun intended. Seriously. I did not intend that almost pun. Then I saw a screening of Anonymous. Very good. I think I’ll see this movie again when it comes out (soon). I was distracted by very annoying people sitting next to me who when they weren’t talking to each other, one or the other of them had their phone out. That kind of behaviour is rare at TIFF and I wanted to kill them. But LOVED the film’s theory on Shakespeare. Loved it. Then came Pariah, which I understand was one of the darlings of Sundance last winter. And often those films don’t do as well with a “real” audience vs. the industry audience at Sundance, but I loved it. I’ll talk about this one later, too… But I was riveted. Touching coming of age story at its core. Stunning performance by the lead. 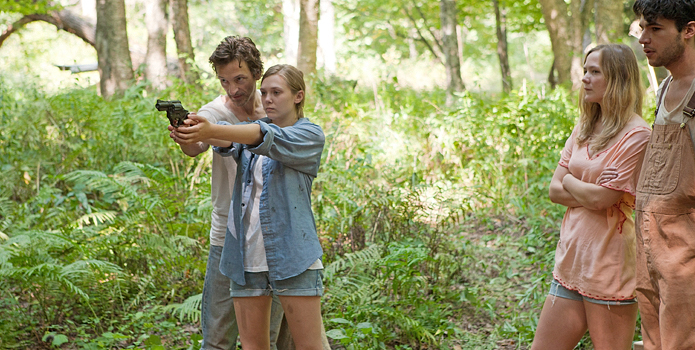 Then my last film of the day was Martha Marcy May Marlene. VERY interesting and tense. Loved it. Again, a stunning performance by the young lead (who happens to have very famous older twin sisters… named Olsen…) A non-hollywood ending that will make some people crazy (a few people swore aloud) and had me sitting stunned through the credits while the theatre cleared out. I have a new theory about the ending… Now can’t wait for someone else to see it so I can discuss. Sorry for the very vague references and incomplete reviews. I promise I will talk more about these films and post some pictures as soon as I get some sleep! Fright Night — UF or Horror? I posted a review of sorts for Fright Night over at Drunk Writer Talk. If you’ve seen Fright Night, is it horror or Urban Fantasy? Do you think there are true Urban Fantasy movies? I seem to be forgetting a lot of things lately. To many things on my mind? Not enough? Last evening I had a ticket to see a screening and discussion of Double Indemnity as part of the CBC/Tiff “Books on Film Club” and forgot. Around 5:30 or 6:00 (would have still been plenty of time to get home, grab ticket, and rush over to Tiff Bell Lightbox… I thought, Hmmm… maybe I’ll go see a movie. Went to see the new Pirates of the Caribbean movie, mostly because it was the one starting. Was bored, bored, bored, bored. Not sure why. Was it just my mood? Did others enjoy this movie? One of my WIP’s that’s more of a WFIP (formerly in progress) is/was a series of interconnected stories about single people. And I was planning to have the audacity to to suggest that some of my characters were very happy about their marital/relationship status. I have nothing against marriage or other forms of domestic partnerships and I’m sure many people are extremely happy in their marriages. But what irks me is the assumption that many/most married people have that people who are not married are defacto unhappy or missing something in their lives. That they’d be happier if only they were married. This assumption really offends me and that’s the theme I was hoping to bring out in my book. That happiness comes in all kinds of packages. It’s not one-size-fits-all kind of thing. And without turning this in to a way-too-personal post when it was supposed to be a movie review… I’m not anti relationship. If the right man came along. Sure. But I so love the freedom I have now to do whatever I want whenever I want. 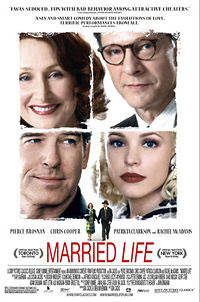 Now, my book never got off the ground for a variety of reasons… I may still write it some day… but watching the film Married Life made me think about it again, because it made me a little bit happier about my single status. The Globe and Mail reviewer, Kamal Al-Solaylee suggested in his review that the film Married Life poses two questions. One: can you build your happiness on the unhappiness of others; and two: can attempted murder spice up a marriage. All I can say to that second question is, “HUH?” Did we see the same film? Just shows how different two people’s perceptions of the same film can be. I’m really curious to know if Mr. Al-Solaylee is married and my guess would be yes. And that his marriage needs some serious spicing up. For me, the second very obvious question asked in the film was: Can you ever really know what’s going on in the heart and mind of the person sleeping next to you. In fact, that question was not just implied, it was specifically asked. And to me, that’s what the film was about. It was a pretty depressing take on marriage if you ask me. Now, not to get too biased the other way, at the end of the film all the characters seemed outwardly happy. Like I said before, happiness comes in all kinds of packages. But by the end of the film there were a lot of secrets never shared between all the couples. Big secrets (including an attempted murder) brushed under the rug, never to be discussed in order to save relationships. Hmmm… Now that I think of it, perhaps it wasn’t meant to be an entirely negative look at marriage, merely a realistic one but brought to an extreme to make a point. Interesting film, anyway. Not amazing. Didn’t entirely work for me, I think mostly because of the Chris Cooper character. I normally love him in just about anything… but I found his character’s motivations too much of a stretch to be believable in this story. But obviously the film got me thinking. I’d recommend it as a rental, unless if you suspect (or know) there’s a big secret between you and your significant other. Warning. Watching this film together might bring secrets to the surface, and this film certainly suggests that some things are best left buried.